High domain authority (DA) and page authority (PA) Web 2.0 posts and profiles are one of the best backlinks you can get for your website nowadays. If you are one of the people who likes their website’s off-page portfolio to be clean and high quality, high PA Web 2.0s is something you should be looking for. But, creating a Web 2.0 account from scratch and then taking its page authority to higher levels takes some time and effort. Today, I will teach you how you can skip this process and directly find expired high PA Web 2.0 profiles ready for re-registering. For those unaware, an expired Web 2.0 is simply a profile on a Web 2.0 site which has been suspended or completely deleted for whatever reason. Most of the time, such expired profiles will be ready for re-registering after some time or even immediately. And there are thousands of them just waiting to be snatched by someone. All you have to do is find them. Let me show you how you can do that. The process is extremely fast and easy, so it won’t be long before you become the proud owner of your very own high PA Web 2.0 PBN. A step-by-step guide for finding expired high PA Web 2.0 profiles on major Web 2.0 sites such as WordPress and Tumblr – I will find a bunch of expired high PA Web 2.0 profiles in front of your eyes in less than an hour. How you can use your brand new high PA Web 2.0 accounts. How you can prevent them from being deleted again. The next thing you will do is get a Moz API key and enter it in your Page Authority addon. Simply open up the addon, click on “Account setup”, and then input your Moz API key there. Okay. We have our Page Authority addon ready. Now open up the Vanity Name Checker addon and click on “Settings”. You will be shown a list of the Web 2.0 sites which Scrapebox supports. The vanity name checker will simply check a Web 2.0 profile and see if it is available for registering or not. That’s it. For this example, I will be finding expired high PA Tumblr profiles, but you can go with any of the ones listed there. 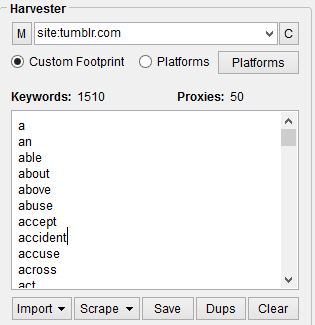 Alright, close the addon now and divert your attention to the “Harvester” section of Scrapebox. Click on the “Custom Footprint” radio button if it is not already selected, and then enter in the input field above it the following: “site:tumblr.com” without the quotes of course. For those who do not know what that is, it simply means that Scrapebox will look for URLs which contain the domain “tumblr.com”. First of all, you will need to “Trim to Root” the scraped URLs and then you will also need to remove duplicate URLs. Okay, now we are left with unique Tumblr profiles. Now click on “Export URL List” and then click “Copy all url’s to the Clipboard”. Open the Vanity Name Checker addon. As you can see, most of the profiles are already taken, but there are those which will be available. And that’s what we are looking for. The next step is to click on the “Export” button and then “Export sites available as text”. This will save all of the available Tumblr profiles at the destination of your choice. Name the file “available tumblr profiles.txt”. Okay awesome! We have found some expired Tumblr profiles. Now, let’s check them in terms of PR, DA, MozRank and PA, so that we find the ones we actually want. An expired Web 2.0 with zero PA is just like a newly created Web 2.0, so we don’t want those. Let’s start with PR. 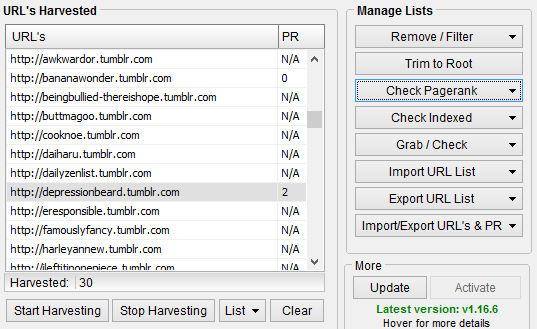 Quite simply clear the “URL’s Harvested” section of Scrapebox and import your “available tumblr profiles.txt” file. Then click on “Check Pagerank” and then select “Get URL Pagerank”. Note that you need the URL PR, not the domain PR, because the domain PR is for “tumblr.com” and it will be the same for all of our expired Web 2.0 accounts. Now, I know that PR is not a great indicator nowadays since it doesn’t get updated that often, but if there is a Web 2.0 profile with a PR, this means that it is quite good. As you can see from above, we have one Tumblr profile with PR2 and one with PR0 which is nice. But, what we are really looking for is page authority. Let’s see what Moz has to say about these expired Tumblr accounts. I am now the proud owner of a Tumblr account with 32.43 PA and 3.14 MozRank. Then, if I do the same for the remaining 16 Tumblr profiles I will be left with a total of 17 high PA Tumblr accounts in less than an hour. Not too shabby huh? You can then simply do the same thing for the other Web 2.0 sites supported by Scrapebox and in no time, you will own a high PA Web 2.0 PBN which will boost your website’s rankings much faster than regular Web 2.0 links. So you worked hard all day long and you managed to create your high PA Web 2.0 PBN. But what can you do with it? Well, the most obvious choice would be to use it and create backlinks for your websites. You can import the accounts into FCS Networker and use it to drip feed projects on your precious Web 2.0 private blog network. Another option you have is to offer a service on Fiverr, or some online marketing forum where you can sell backlinks from your PBN at a reasonable price. You can also sell the high PA Web 2.0 PBN itself to someone – many people are looking for such offers. Chances are, you will be creating posts with backlinks to your websites. A few beautiful and quality links from your high PA Web 2.0 private blog network will do wonders in terms of ranking your websites in the SERPs – of course depending on the competition of your target keywords. So there you have it. Now you know how to quickly and easily find expired Web 2.0 accounts, filter the ones that have high page authority and MozRank, and then re-register them manually – all this done using just Scrapebox and a bunch of private proxies from BuyProxies. Of course, if you don’t have the time to perform this process of searching for expired authority Web 2.0s, there are services and software you can take advantage of. For example, you can use Domain Hunter Gatherer (our tutorial and honest review), which is a very easy-to-use desktop application and its “Premium” plan priced at $17/month allows you to easily find expired Web 2.0 accounts. What DHG will do is basically enable you to enter a bunch of keywords, and then it will list all of the expired Web 2.0 accounts on sites such as WordPress, Blogspot, Tumblr, Weebly, LiveJournal, Tripod, and many more, which match your target keywords along with many stats such as PA, DA, PR, age, search engines index status, social signals, etc. Simple as that. Bottom line is finding expired authority Web 2.0 accounts is not difficult at all and with all the advanced software that marketers have created, anyone can do it. The real question here is how you will use the profiles once you have them under your control? Will you get them deleted again or will you use them with caution and grow their authority even more up to a point where they start ranking pretty much anything? Good choice. Now click here for the continuation of the expired saga – a step-by-step tutorial on finding cheap high PR expired domains. See you on the other side.